Tea Cups | The Happy Wonderer ~ ellen b. My trips to my favorite Goodwill store in the area have been very infrequent the last couple of years. Lately I need to have something specific that I’m looking for to hit the thrifts or be right in the neighborhood doing something else. This last week I was looking for a book by a certain author and saw this in the collectibles section. 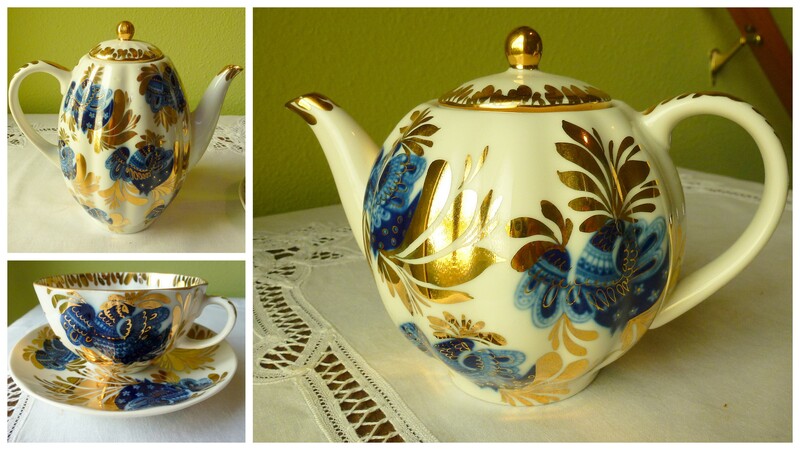 This is Lomonosov Golden Garden china made in Russia. I bought these pieces for $29.95. 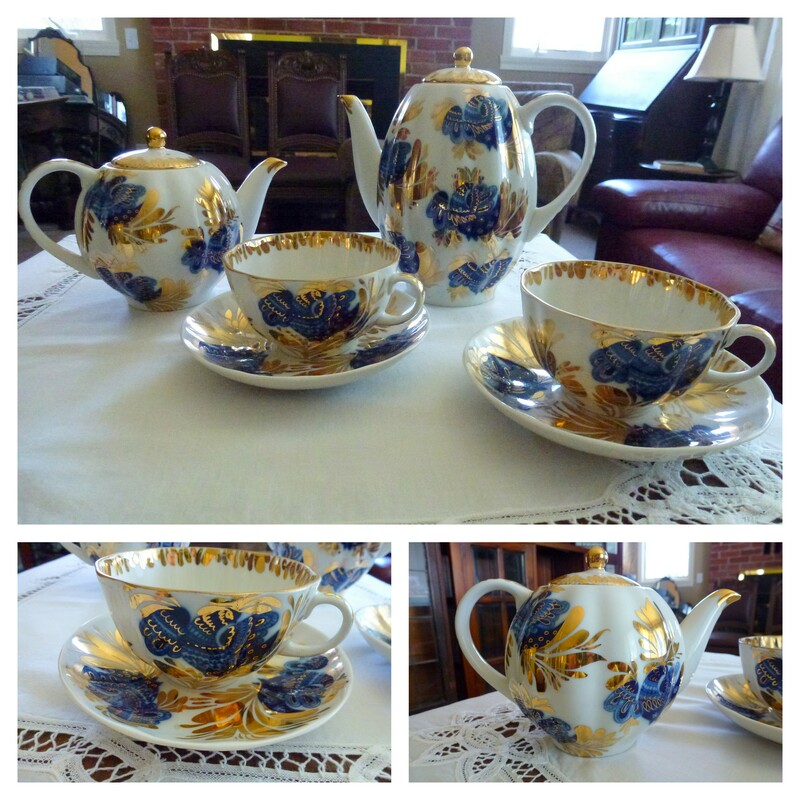 When I looked online for prices just the cup and saucer was going for $75.00. 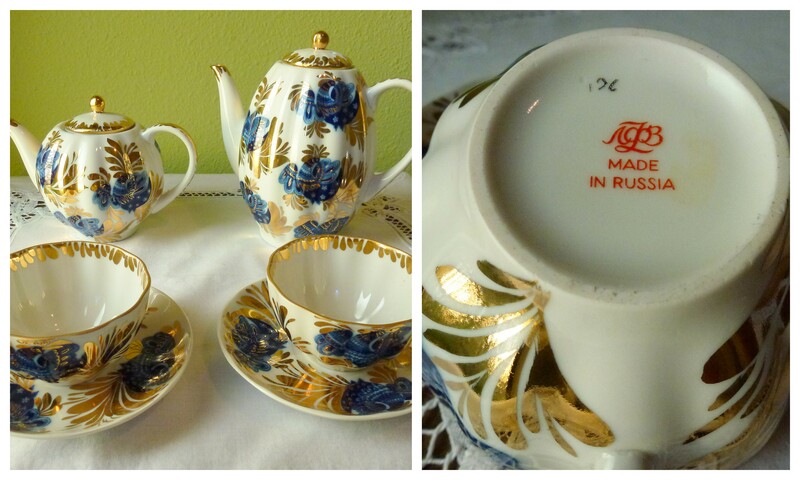 I need another tea set like a hole in the head but since this was a Russian set I wanted it. I am going to release one of my other sets for this one. I figure that’s a good trade off. We had a productive weekend at this old house. I’m looking forward to a week where I’ll not be confused on what day it is. Holidays in the middle of the week throw my day compass off. I’m joining in with Mary at Little Red House for her weekly meme, Mosaic Monday. I found these pieces at a thrift store. They are Johnson Bros. I got several round and square dessert plates, too. These are a few of my tea cups with pink. Hope you all are having a lovely Fall. I’m still waiting for cool temperatures here in Southern California to give me the sense of Fall. Have a great week and have a cuppa soon! 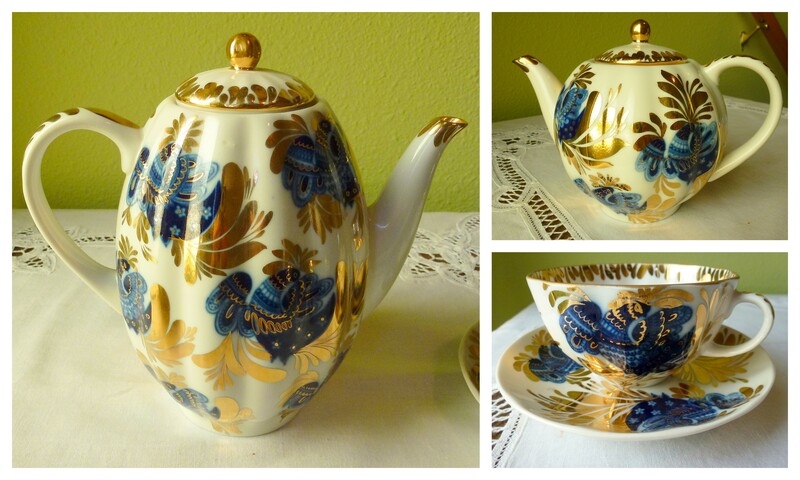 I’m joining Kim at Shabby, Pink and Pretty this week for Tea Things Tuesday. Click on over and join in the fun. This is a photograph of a window through a mirror of a great Tea Shop that has since changed hands and changed decor. I miss this Tea shop and the owner who was a gem. 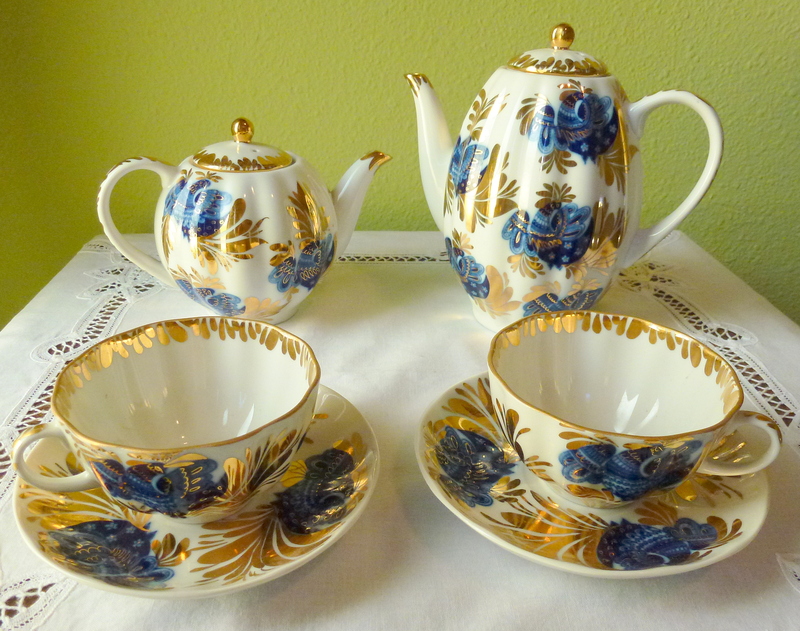 These are a few of my blue tea cups and saucers. When I’m at my home in Washington I usually change the tablecloth on our only dining table every couple weeks. Because our stay here is winding down and we have no more big events I took out a couple leaves from the table and found a shorter tablecloth. Having my new inspiration for Tablescape Thursday it was time to search high and low for what to add to the tablecloth. I started with the hydrangea in one of my depression glass containers and candlesticks. Some fun layering of plates. The smaller salad/dessert plate is Royal Swan, Blossomtime, Staffordshire, England. The larger floral edged plate is Nikko tableware. The tea cups and saucers are Churchill. The gold tassel napkin rings were Target Christmas clearance. The tablecloth and napkins are from Goodwill. For more Tablescapes please visit Susan at Between Naps on the Porch! It’s time for Three or More at The Gypsy’s Corner. Visit Tam to join in on the fun posting anything you want that’s three or more. I found these goodies today at my local Goodwill. Monday is Senior day and they give a 25% discount to anyone 55 or older. I bought all this stuff for $7.00. Four goblets that I think are really great, 5 napkins, and 3 Teacups and saucers. Thanks for visiting me and continuing to enable me in my Thrift store shopping addiction.